Enjoy beautiful Ocean & Beach Views right from your deck! 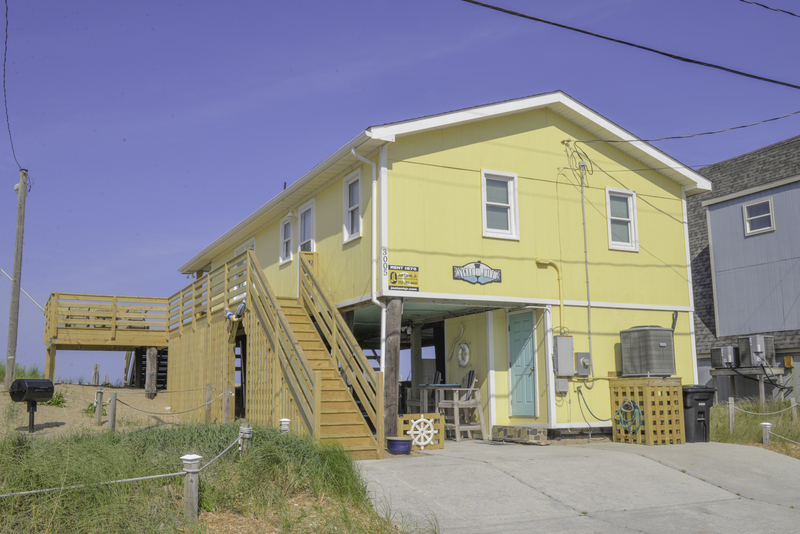 Yellow Bird is a terrific Kill Devil Hills beach cottage that features bright decor, comfortable furnishings, & steps that lead right down to the Beach. This very nice home that is lovingly cared for & it shows. Your family will love the location & will want to return year after year! Ground Level: Parking for 3 Cars, Steps to Entry, Utility Room w/Laundry Area & Half Bath, Picnic Table, Park Grill. 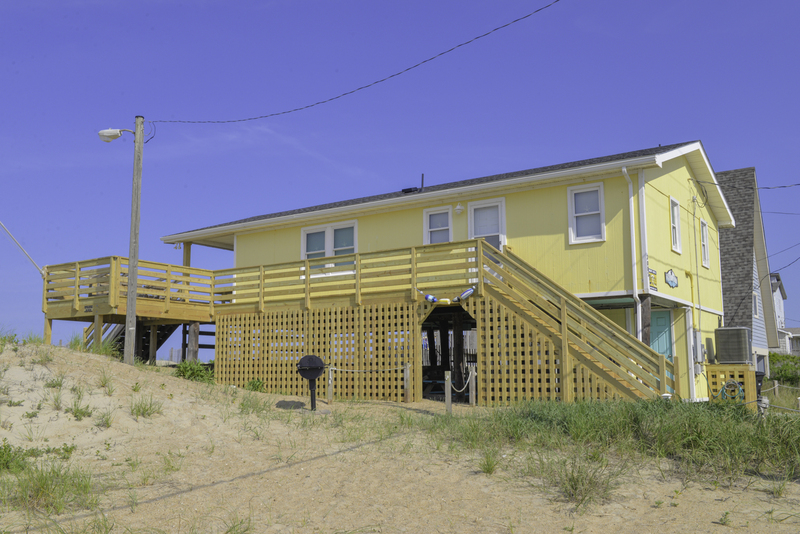 Main Level: Living/Dining/Kitchen, Ocean Views, Large Flat Screen TV, Stereo w/CD, 4 Bedrooms (1 w/Queen & 1 w/Duo Bunk, Shared Full Bath, 1 w/Queen, 1 w/Double, Shared Full Bath), & Covered Deck w/Picnic Table, Deck Furniture, & Steps Down to Beach. Features include: C/AC & Heat, Washer/Dryer, Dishwasher, Microwave, TVs, DVDs, Wireless Internet, & Deck Furniture. No Check-Ins Prior to 4:00 pm. No Pets. This is a Non-Smoking Unit. Overall, a beautifully decorated home. We have stayed in the YB many times. It is our favorite house in OBX. The location of the house is excellent, we thoroughly enjoyed the porch overlooking the beach. We loved almost everything about the Yellow Bird. Amazing location. Comfortable beds. Nice decor. The covered deck is amazing. I can honestly say the yellow bird is by far my favorite vacation rental we have had the pleasure to stay in. We absolutely loved everything from the cleanliness, the decor, the covered porch, the view!!! We vacationed with another family this time with two children. The girls loved to swim and then head inside for a break and then back to the waves. We travel from New York and always stay ocean front, but the yellow bird will be the only place we stay in from now on!! Thank you for opening your "yellow bird" to us. Memories were made that we will all cherish forever! Great location, love the porch. Love the house and location. I enjoyed the house and the beautiful view. Proximity to beach is great. Deck with roof is great.